The Blooming Rooms core online service is the Room Recommendation package where, based on key information you provide, you receive a design recommendation that is customised to the room and your particular circumstances, without the need for a visit by a designer. 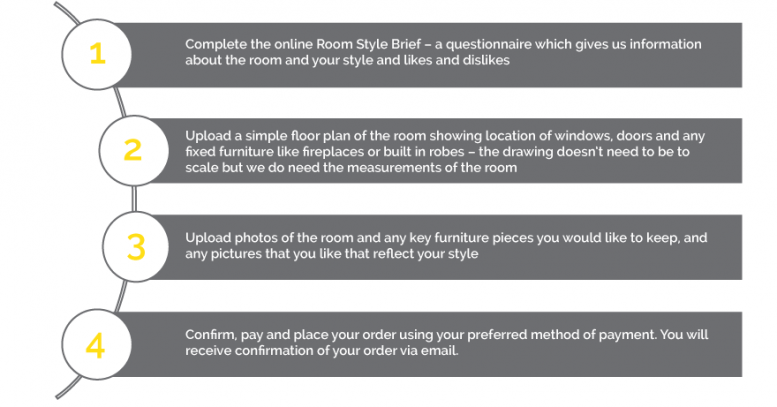 There are options to upgrade to gain a more customised level of service depending on the complexity of the room. Completing your order normally takes two to four weeks and we will can keep you informed along the way on progress and if we have any questions. 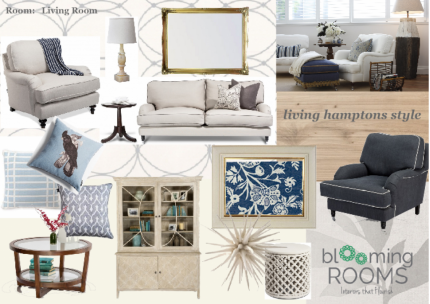 A Digital Mood Board showing key items including paint, fabric or wallpaper options, furniture and other key decorator items. Some examples of Digital Mood Boards can be found here. A basic Floorplan (to scale) showing placement of key furniture items. A Supplier Schedule detailing each key item, the name and contact details of the supplier and the cost of the item at the time of the order. © 2014 bloomingrooms.com.au | Designed by Gigi & Lulu|ProPhoto Photo Blog by NetRivet, Inc.